﻿ It’s a case of tragic irony that, while so many bands are starting to get noticed through genuine, undeniable talent, In This Moment are heading down the same path thanks to looks and nothing else. That’s not an unfair assumption either; if Maria Brink wasn’t stuck at the front of this band and objectified to the nth degree in every promo shot, In This Moment would be falling down the same hole of rock radio filler material as plenty others peddling a similar brand of drab, synthetic alt-metal. With that in mind, there’s a limit to how much bile can really be unleashed upon Ritual; it’s a completely pointless slog that doesn’t need to exist whatsoever, but for six albums in, it’s the sort of thing that’s expected from a band with as limited a skill set as this, and thus it’s not quite in the same league as some of the catastrophes released this year. It’s still nowhere close to good though, mainly because of its ham-fisted dilution of a branch of metal that’s weak to start with pop production that couldn’t be more blatant. To that extent, even lumbering, overweight bores like River Of Fire and No Me Importa are at least tolerable. Instead, Ritual plunges to its true nadir on tracks like Witching Hour or Roots, the latter especially in which it sounds like not a single human was present for its recording in its stiff, programmed drums and complete absence of audible guitar, and where sleek, entirely unnatural production runs into overdrive. The thing is, In This Moment don’t benefit from really any of it, and when they do actually let their harder tendencies loose, they aren’t too bad. There’s a propulsive march to Joan Of Arc that’s one of the few times the album runs on any real firepower, and Half God, Half Devil is low-slung and heavy enough to stand as a pretty decent hard rock track. If only more of Ritual would fit in a similar mould, and considering the loose thematic arc surrounding the Salem Witch Trials (which, going by a handful of tracks near the end, is very loose indeed), there’s nothing in the way of dirged-up blues or sludge that could at least draw some interesting parallels, or fit the mood of what’s being said. It only makes such a cold, lifeless presentation all the more counterintuitive, putting modernity ahead of getting the most out their content. Even in the case of Maria Brink, the natural, expressive power that her vocals have are almost completely neglected here. There’s the Euro-metal bombast of Joan Of Arc or the big arena chorus of Black Wedding alongside Judas Priest’s Rob Halford, but beyond that, it’s all a total waste. When she’s not being “seductive” / histrionic in a way that will make you want to rip your own eyeballs out, she’s floundering in copious levels of manipulation to the point where she’s virtually incoherent on Oh Lord and Lay Your Gun Down, or a robotic non-presence on a frankly shocking rendition of Phil Collins’ In The Air Tonight. It really does reach a point where Ritual feels so poorly conceived in almost every manner that you have to wonder exactly what In This Moment were going for here. The ship might’ve sailed for artistic growth and progression, and all Ritual does is deepen the gully that the band have created by sticking to their inexplicably popular guns. It’ll probably do well – In This Moment have that sort of hold now where it would take a real disaster for them to flop – but that doesn’t warrant giving this a pass, purely because Ritual is such a cynical, overwrought attempt at rock music that it really doesn’t deserve that sort of praise. 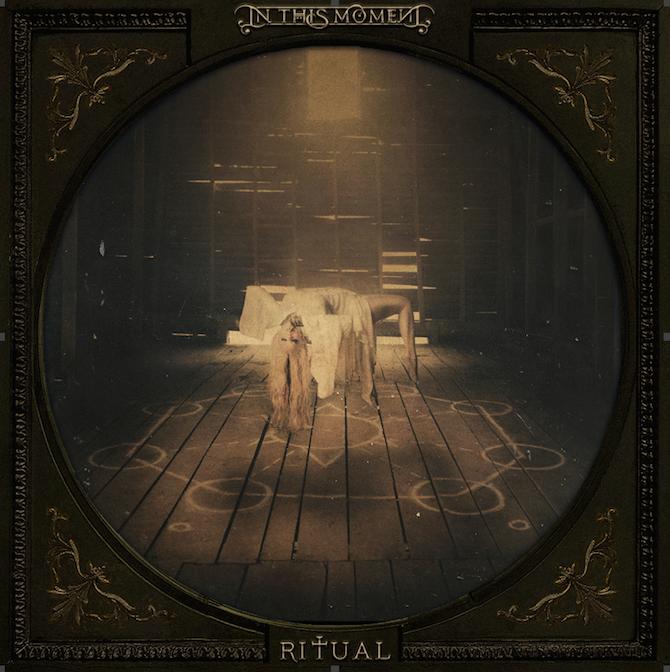 ‘Ritual’ by In This Moment is out now on Atlantic Records.